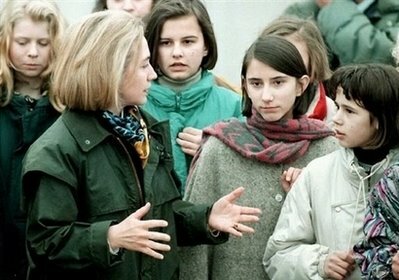 I just have one question: Why did Hillary repeat her embellishment on her 1996 Bosnia trip, even when small newspapers were onto the inaccuracies in her story? Frank Rich of the NY Times asked that question over the past weekend (registration required). No, actually, I have a far better question: Why didn't she simply point to her travels as senator in her argument that she is the most experienced candidate. She did go to Iraq, correct? Why not mention her trips to Iraq? It's dangerous, right? This speech (below) was one of her best on the senate floor. Meanwhile, looking back at what Barry did two weeks ago, I can now say with confidence that his speech was a home run. He freaking knocked one out of the park with this March 18th speech. Say hello to your next president. It's about time we had a progressive with a brain.